To add to the sporty feel of the hot little Suzy we had it during the Gold Coast Commonwealth Games. The 11-day period meant our bright yellow machine felt right at home, being eager, exciting and enjoyable for every minute. Best of all the roads were very quiet and we could buzz from place to place with ease. The Queensland government and the GC organising committee seriously overdid their predictions of doom-and-gloom and traffic nightmares and made life simple for us. This little Suzy always feels light and eager, more about that in the Driving section of this review. 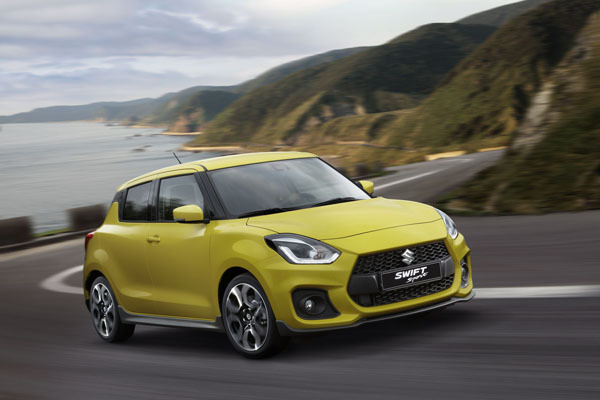 Though it carries styling cues from the five million Suzuki Swifts built so far this new generation has moved a little more towards a mainstream than some existing Swift owners we have spoken to like. They say the headlights of are not as vertical as they like and that the C-Pillars have lost part of their big n’ bold personality – having two-part upper edges that include the door handles gives doesn’t quite work. 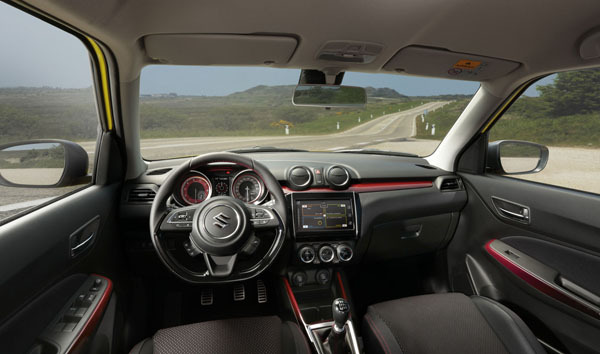 The interior has a strong sporting accent, with semi-race seats with red stitching in the black cloth material and on the leather wrapped steering wheel. Red also features on the instruments, door pulls. The overall feel says little Suzy certainly means business. Power comes from a 1.4 litre turbo-petrol four-cylinder unit delivering 103 kW, and an impressive 230 Nm of torque that reaches its max at 2500 and holds that level till 3500 revs. Even once torque has passed its peak still good grunt till well past 5000. Transmission is to the front wheels through a six-speed manual or six-speed auto. Thankfully our car had the DIY gearbox. Somehow the thought of owning an automatic Swift Sport leaves us cold; however, we did sample an auto during track testing at the Norwell Motorplex a couple of months back and have to admit it wasn’t too bad. A 7.0-inch four-segment touchscreen is well positioned at eye level. It provides minimum driver inattention and gives access to audio and navigation. Apple CarPlay and Android Auto also connects you to your smartphone. The sub $30,000 Suzuki Swift Sport Turbo has many safety features usually only found in cars costing on the wrong side of $75,000. They include Adaptive Cruise Control (ACC); Dual Sensor Brake Support (DSBS) that detect not only other vehicles, but also pedestrians. It brakes the car if the driver hasn’t taken action. Lane Departure Warning and LaneWeaving Alert (LDW) are also standard. Cleverly, LDW takes note of the normal driving pattern of the person at the wheel and issues a warning if the is wandering from its usual way – such as through mobile phone usage or driver drowsiness. Automatic high/low beam headlights make life even simpler when driving in varied conditions. Track testing at the Norwell Motorplex – about midway between Brisbane and the Gold Coast – showed the little hotshot could be pushed to its limit and remain easily controllable. The Swift tells you what it’s doing through the wheel and by the seat of the pants. And is easy to bring back to the straight and narrow should it start to wander. On the open road grip during our test week it remains as impressive as at the track, obviously we were keeping the Suzuki Turbo well within its limits and you can corner hard without taking any risks. Ride comfort is okay on normal roads, but harshness does creep in as soon as you’re on anything other than smooth surfaces. Road noise isn’t too bad but, again, the rough stuff does mean you have to wind that stereo up. The Swift Sport Turbo has plenty of punch from its little 1.4-litre powerplant, and the small size of the engine means turbo lag is minimal. Once the turbo is up and running to best effect there’s solid acceleration that makes overtaking safe and simple. We found it happy to climb the arch of Brisbane’s Gateway Bridge in top gear, and even to accelerate if need be. The gearshift in the manual is light and reasonably positive, though not really of a full-on sporting nature. Fuel consumption isn’t likely to be the first priority in the minds of keen drivers, but we are pleased to report it will sit under five litres per hundred kilometres on motorways and you have to be working it hard around town to get it to seven litres per hundred. 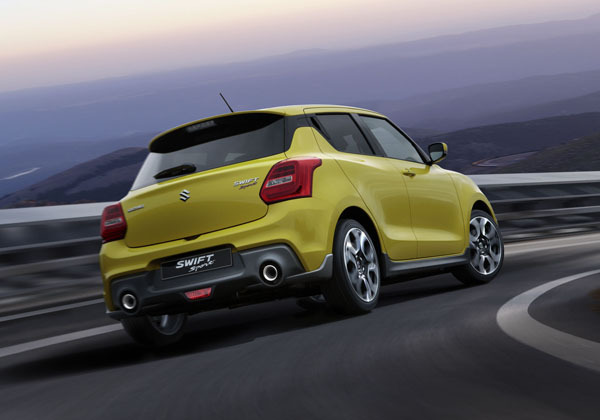 The all-new Suzuki Swift Sport Turbo is a superb piece of engineering from the company that’s arguably the best in the small car field. Definitely one to put on your short list if your budget is tight and you’re a keen driver.